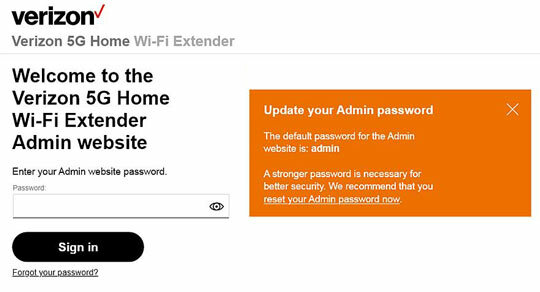 Ensure you have an active connection (wired or wireless) between the router and the device you're using to access the Wi-Fi Extender admin page. If the initial setup is not complete the network name "Verizon Extender Setup - XXXX" is displayed. Establish a Wi-Fi or wired network connection with a device (e.g., computer, smartphone, tablet, etc.). Alternatively, enter 192.168.0.250 into the URL address field. Enter the password then click Sign In. La contraseña predeterminada es "admin".